I recently bought some Creation is Messy (CiM) maraschino glass and it’s a lovely bright red. 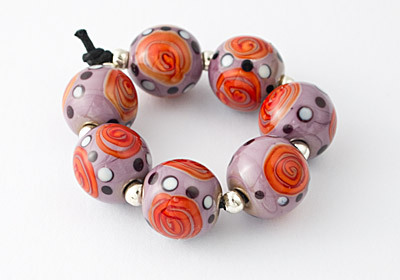 It encases white beautifully and gives it a transparent red-orange colour, as in the swirly lampwork beads below. Some colours of glass can boil easily, but I’ve found this particular colour to be fairly stable and easy to use. What to make? I decided to make some lampwork strawberries as it’d been a long time since I’d made some and thought that the colour would make lovely bright coloured strawberries. However, I was quite pleasantly surprised at the finished colour of these beads. They have an opaque core with what looks like a thin layer of clear encasing on the outside. To me, this just enhances the beads, but it’s something to consider when using this glass. This glass is one of my favourite ones as it’s such a cheerful colour. These strawberries have small spacer beads made with dark red Effetre glass – you can see the contrast in colour, which I love. 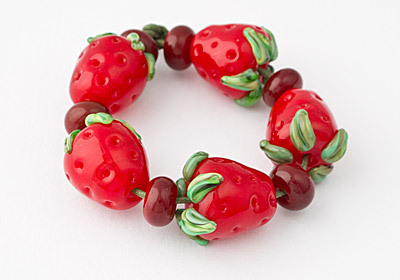 i love this strawberry bracelet,can i buy one anywhere? I haven’t got one in stock at the moment, but could certainly make one for you. I’ve just sent you an email with details. Purple and orange do go together! Who knew? I love the strawberry bracelet too! Can you send me details about ordreing one? 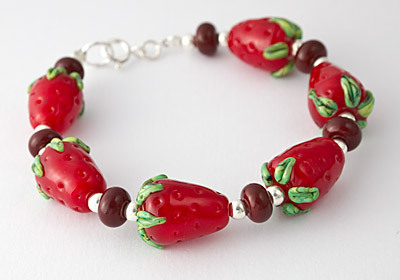 A sterling silver strawberry bracelet similar to the one below will cost £35.00 (see image below). Please let me know via email at enquiries@cielcreations.co.uk if you’d like to go ahead with the order.